By 1870 the quarrying process at Mountsorrel involved removing topsoil and overburden first, then steel drills were driven into the rock face using heavy hammers. The men carrying out this work were suspended in front of the rock face by ropes. A gunpowder charge was then inserted into the drill hole and ignited with a slow fuse. Blasting was usually timed to coincide with meal breaks to minimise casualties and to prevent injuries to the workforce. 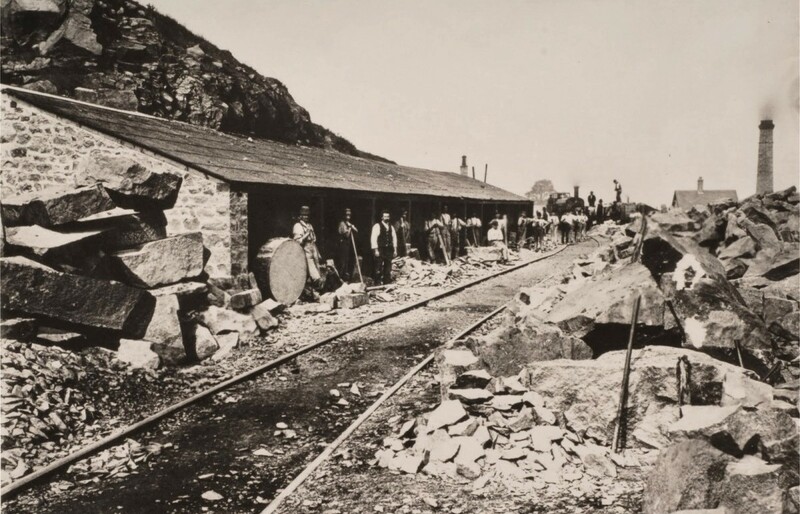 After blasting, large masses of stone were broken down on the quarry floor where they had fallen. A group of skilled men, known as the ‘Blockers’, would further split the stone into smaller blocks or strips. The stone was then carried in tubs to the sheds or shelters, located within the quarry, where the sett-makers and kerb dressers worked. The sett-makers or ‘squarers’ then worked the stone into cubes of the correct size, and their ‘boys’ (usually members of their own family) smoothed the surfaces of the setts with small hammers. The kerb dressers or masons were fewer in number and required great skill to create the longer and often curved kerbstones. Waste left over from making setts and kerbs were arduously broken down by hand into stone chippings. Thanks to a grant from the One Family Foundation we have been able to construct three such Stonemasons’ Huts from the local granite. In the summer months we intend to run demonstrations showing how the stone was worked.